GuerrilleReina (Warrior Queen) is the second movement in a suite of performances and photographs from my most recent series REINAS (Queens). 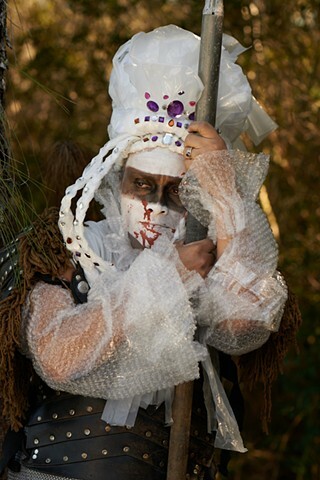 Made to emulate a warrior, this queen's regalia is comprised of barbarian armor, bubble wrap, plastic sheeting, bed linens: materials used, in varying degrees, for self preservation. In this series of photographs, our warrior queen leads the charge to battle, yet there is no army, no visible threat, no determined end goal or lands to conquer or defend. In this series I attempt to understand the battlefield of my own heart.